Today is Tuesday, May 30, the 150th day of 2017 in the Gregorian calendar, with 215 days remaining. Donald Trump has been President of the United States for 131 days. There are 1,332 days remaining in his term, assuming he doesn't resign or is otherwise removed from office. 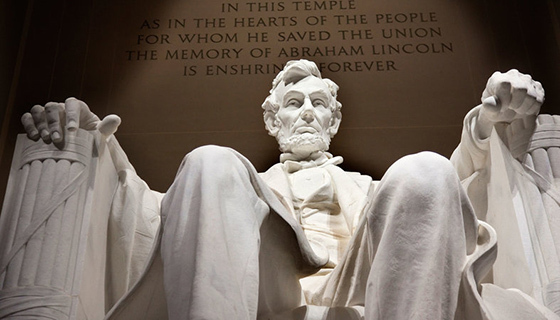 On this day in 1922, the Lincoln Memorial was dedicated in Washington, D.C. The Memorial is free to the public, and is never closed. Among other things, today is also National Mint Julep Day. $25K swan statue recovered after naked Florida man stole it, deputies say. "All mothers are mothers of great people, and it is not their fault that life later disappoints them." Before diving into more weighty content, it's a relief to see the Wonder Woman movie opening later this week may break the string of emotionally unsatisfying and dark DC Universe superhero movies. Good morning, Mister Moth: Lab-created moths with a 'self-destruct' gene to be released onto U.S. farmland. New study finds that sleep deprived brains literally eat themselves. Doesn't Trump only sleep three or four hours a night? Well, at least this explains his tweets. Android-targeted 'Judy' malware may have infected 36.5 million phones. The software doesn't really do anything to your data- but it would make your phone click on Google ads, generating fraudulent revenue for the attacker. "From horrible to bad." A possible glimmer of hope for America's ailing honeybees. Fewer bees died this past winter than in the past ten years. The rate's still too high, though. This kind of stuff used to happen in the U.S., but nonetheless something incredible is happening right now in Chile. Highest aviation alert level issued after Alaskan volcano erupts. The Alaska Volcano Observatory says Bogoslof Volcano in the Aleutian Islands erupted at 2:16 p.m. Sunday and sent a cloud of ash at least 35,000 feet high. The eruption lasted 55 minutes. David Letterman talks Cosby, the beard, and why Amy Schumer is the new Richard Pryor. Swell. The people who bring you The 700 Club ask, Trump's promises to Israel foretold in the Bible? Europe was the birthplace of mankind, not Africa, scientists find. Although... "I would be hesitant about using a single character from an isolated fossil to set against the evidence from Africa." Trump administration plans to minimize civil rights efforts in agencies. Since making America great again apparently involves ignoring the last six decades of the fight for civil rights. Well, this is cheerful.. Bug in Google Chrome allows sites to record audio and video without a visual indicator. The bug is not as bad as it sounds, as malicious websites still need to get the user's permission to access audio and video components, but there are various ways in which this issue could be weaponized to record audio or video without the user's knowledge. William Shatner is biting his tongue under President Trump: 'I won't do anything that might get me deported.'. Looks like Captain Picard is the one with cojones: Actor Patrick Stewart applying for US citizenship to fight Trump. George Takei dismantles racist, sexist criticism of 'Star Trek: Discovery'. And in other fictional character news, Superman is suing his former landlord. You should watch this. Anti-terrorism ad goes viral in Middle East. Making America great again by destroying our international stature. "West Virginia has the highest overdose death rate in the country, and heroin has devastated the state's Eastern Panhandle, which includes Hedgesville and the larger town of Martinsburg. Like the vast majority of residents there, nearly all the addicts are white, were born in the area, and have modest incomes. Because they can't be dismissed as outsiders, some locals view them with empathy. Other residents regard addicts as community embarrassments. Many people in the Panhandle have embraced the idea of addiction as a disease, but a vocal cohort dismisses this as a fantasy disseminated by urban liberals." A fascinating read. Also disturbing: Authorities are investigating dozens of cases of drug theft at Veterans Affairs hospitals. I'm 62 and this article made me feel much better about myself: A selection of the 30 most disappointing people under the age of 30. The world that Trump and Ailes Built. The measure of their influence lies in the distance between today's media and politics and those of the years they were born. Mystery of the flickering red lights in the White House grips the Internet. The Internet really needs to get a life. Format change: After reviewing survey results and performing a cost/benefit analysis, I've adjusted the content of KGB Report to include more news and comment and reduce specialized and "reference" content available elsewhere. Comments welcome- tweaking is ongoing.